We caught a lot of quality browns this trip. We caught 14 browns over 5 LB. this trip! Wayne picked up a little brown at Crescent. Vince got this 5 LB. East Lake brown for the best of the day while fishing with me. Vince caught this nice brown pushing 5 LB. during an afternoon bite at Crescent Lake. Vince Cattiottoli with his 6 LB. brown from Wickiup while fishing with me in Aug. 2007. Vin Man with his best of the trip. Killer hookjaw went over 8 LB. Unofficial WR Artic Char on a fly. Caught from the Tree River. Unofficial first double digit brown from Lower Twin caught on opening day 2016. Weighed in at 10 Lb. 10 oz. Congrats man! Uncle Ray with a nice hen brown. Photo courtesy Joe Mitchell. Tyler with his personal best brown. The 27.5 in. hen weighed in at 8 LB. 6 oz. Congrats man! Tyler Holland banged his second brown over 10 LB. with this killer hookjaw 10 days after he caught a 12!.......Congrats man! Tyler busted this 12 Lb. hen this past week. His first over 10 LB. Congrats to you and Bobby both! Tyler Holland with this trophy 5 LB. brown from a small California River. He is mounting it with us. Congrats man! Two fat browns from Wisconsin side of Lake Michigan. Two browns over 10 LB. in a few hours.......LUCKYYYYY! Two 6 Lb. browns in this "Double." TTG Guide Partner Miles Rushmer put this client onto a MONSTER NZ brown! Travis with a cool hookjaw brown! 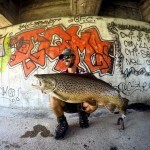 Took this off a FB page.....suspect it is a European brown species, Marble trout, type of Tiger trout? 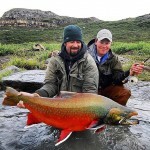 It is a killer trout for sure! Took my buddy, Dave Rossberg, out for a morning on East Lake. This 4 LB. brown was one of 13 we caught that morning. Tony with a nice hookjaw brown. Tony was the "hot hand" when we caught several nice browns casting at Wickiup. Tony Sherman's dad with a killer hookjaw. It was released. Congrats man! 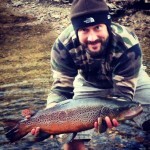 Tony Sherman with his second brown over 10 LB. Congrats man!